These stretch cords were about to become my next contribution to the DI, because they had fallen out of my wardrobe rotation. I thought it was a shame to give them up (they are so comfortable, I could sleep in them). When I remembered this idea, I thought I would give it a whirl. Anyway, if you have a pair of pants that you might want to keep but you dont like the fit on the legs, this is an easy fix. It's like a new pair of pants for free, and what is a better deal than free? If any of you complete this project, drop me a line with your pictures at uberchicforcheap (at) gmail (dot) com. I have some pants that might be perfect for this! That's great! 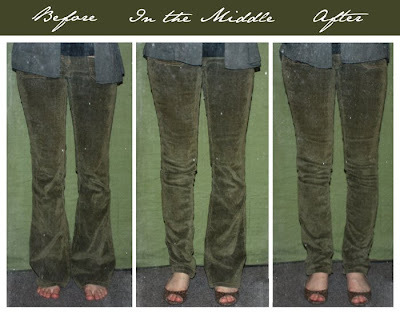 Also, this can be used to turn flares into bootlegs if you aren't down with your pants being skinny.